Maintaining the building envelope is essential to the success of a facility with critical interior space. Facilities Managers for hospitals and medical centers need to be on top of the building envelope integrity so patients and valuable assets are protected. The roof is a very important element that serves as a barrier between the exterior environment and interior space, often taking the most abuse from wind, rain, hail and threat of puncture. If a roof leaks, it could potentially drain water into the building causing mold and damaging the building materials. An acute care medical facility located in Florida, offering a 24-hour emergency department, surgical services and various other outpatient services, installed an Ethylene Propylene Diene Terpolymer (EPDM) black rubber roof in 1999. Just over 15 years after installation this roofing system began to fail, making the roof susceptible to leaks. Hospital officials sought out a roofing consultant to offer a recommendation for the best roofing system to protect their facility. McEnany Roofing, located in Tampa, FL, has been providing commercial and industrial roofing solutions for over 27 years. “We worked on the medical facility’s behalf to recommend a roofing system for this environment,” said Mark Sloat, VP/Senior Estimator at McEnany Roofing. 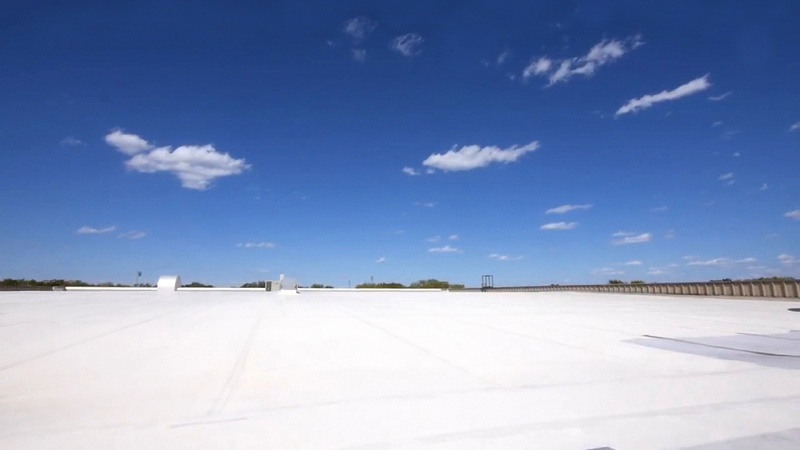 “We used the services of an engineer to conduct an uplift test to help us determine the best roof to suit their needs.” After all the testing and research was complete, McEnany Roofing concluded that a FiberTite roofing membrane was the superior choice. The proven performance advantages in puncture resistance, durability, wind uplift and severe weather protection supported McEnany Roofing’s recommendation and after careful review of the data, the medical facility agreed. In 2016, McEnany Roofing installed over 130,000 sq. ft. of FiberTite membrane on the main hospital and two adjacent medical buildings. Thermoplastic Polyolefin (TPO) was also considered for this project; however, FiberTite’s proven track record was an important factor for this sensitive environment. The water based adhesive used to adhere the 45 mil FiberTite Fleeceback membrane on the upper roof of the main hospital helped mitigate odor. Other areas of the hospital had 45 mil FiberTite-SM installed using the mechanically attached securement. Both processes made this installation conducive to maintain the standards of patient care during installation. The medical center is pleased with the decision to use FiberTite to protect their facility and trusts the FiberTite Roofing System will be durable and reliable for many years to come.